One of the your’s and summer’s biggest and most-anticipated finals, arguably the Grand Slam of the year, starts on Monday. The draw takes place today on Friday in the Big Apple. There could be some exciting matchups, but it’s the underdogs to watch in this final who are showing signs of gearing up, and possibly surprising the top seeds this year. So here are our top four long shots and best bets. All 32 seeds will be obviously be looking to bag this win, however a number of unseeded players are capable of shocking, upsetting or at least surprising one or two giants. Here are the four unseeded players who are lurking in the shadows, menacing the top seeds in the men’s draw. Juan Martin Del Potro is definitely one to watch in the US Open after his huge Rio 2016 Olympic success. If asked, there is not a lot of doubt that any seeded player would not want to be paired with the 2009 champion, since he has been red hot. The Argentinian showed off his skills in a brilliant comeback when he dominated stars Novak Djokovic and Rafa Nadal, on his way to his Olympic silver medal in Rio de Janeiro just a few weeks ago. In Del Potro’s pocket is a huge arsenal of attacks that can usurp any rival, and the crowd favourite will be prepared since he has realistic chances of going far into the second week. He’s the wildcard entry who defeated Stan Wawrinka at Wimbledon, and many believe he will get a favourable draw as he tries to rebuild his ranking and make a comeback to his to the upper echelons of the game where he belongs. Fongini is an inimitable foe, but infortunately for the Italian, he hasn’t enjoyed a prosperous season. His play is volatile and unpredictable and many are never sure what to expect of Fognini, but when he is focused and engaged, his dominant and obvious natural talents spill out, and he has the opportunity to surprise and upset. 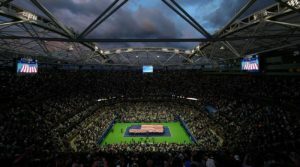 An example of this is when he dramatically ousted Rafa Nadal at the US Open last year, and was able to hold a commanding third set lead over Andy Murray in the Rio Olympics before falling away in typical fashion. Which version of Fognini will show up in New York is always an unknown but he definitely possesses the skillset to do some real damage in NYC. The young and vibrant nineteen year-old is widely believed to have a bright and successful future, when looking to his recent run to the quarter-finals of the Cincinnati Masters, one can see he is waiting to break out. In Cincy, he got a win over an out-of-sorts Nadal, which highlighted and revealed his future potential to fans. Coric’s game style is not flasy or spectacular but his defensive skills and raw speed can wear an opponet down and has enabled him to become a highly effective counter-puncher. He will give any player a tough challenge due to his competitive nature, combative style and ability to stay the course. Muller another player who could come out of left field. Luxembourg’s flag-bearer from the Rio Olympics got to the quarter-finals of the US Open eight years ago, and the quick conditions in New York are perfect for his unrelenting attacking approach and stamina on the court. The left-hander has an effective and intense serve and his skill in the forecourt would fit right in the modern era. He has the outside chance to significantly give trouble to those seeds who have serious aspirations of winning the title, but he is more lilely to upset a lot of lower-ranked seeds to clear the way for the other dark horses.